Have you ever had such a powerful sense of déjà vu that you couldn’t shake it? Felt a strange connection to a certain place, or a certain period of history? Chances are, you’re experiencing the memories of one of your past lives. Start by practicing a form of meditation most comfortable to you. 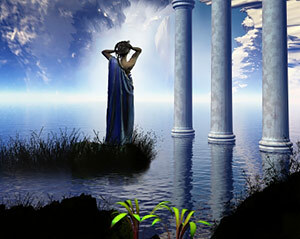 Learn to listen to your unconscious thoughts, for they are usually clues to your past lives. Visualize. what sorts of things appear as patterns in your life? Are there numbers or letters that seem to “follow you” everywhere? Chances are these are important hints as well. Use a channeling device. For example, if you see a certain image, find a small totem in the shape of that image. Keeping a dream journal is also useful for those interested in their past lives. Since dreams are a gateway into the unknown and our subconscious thoughts, images of past lives are frequent in our dreams. Are you dreaming of a distant place and time, such as ancient Rome or feudal Japan? Write down what you remember. Check out a book from the library or watch a documentary on the period if you can. Past lives are a lot like tapestries; our recollections of them are built one thread at a time, and we only start seeing a complete picture after many of these threads come together. But they may not be the picture we expected! Most importantly: use your discoveries as a learning experience, and don’t be disappointed in what you find!